Swiss manufacturer of premium brassware KWC has introduced the Zoe Touch Light Pro mixer tap. It features push button control for hot and cold water selection, with the choice indicated by an LED coloured ring on the touch sensor. The Zoe Touch Light Pro tap can be programmed to suit an individual’s needs and comes with three preset water temperatures. Featuring a swan neck spout, it also boasts luminacqua technology which is a light ring integrated into the pull-out aerator for providing task lighting or creating ambience. In addition, the pull-out tap features a Neoperl spray and the company’s jetclean technology, which is designed to remove limescale deposits. 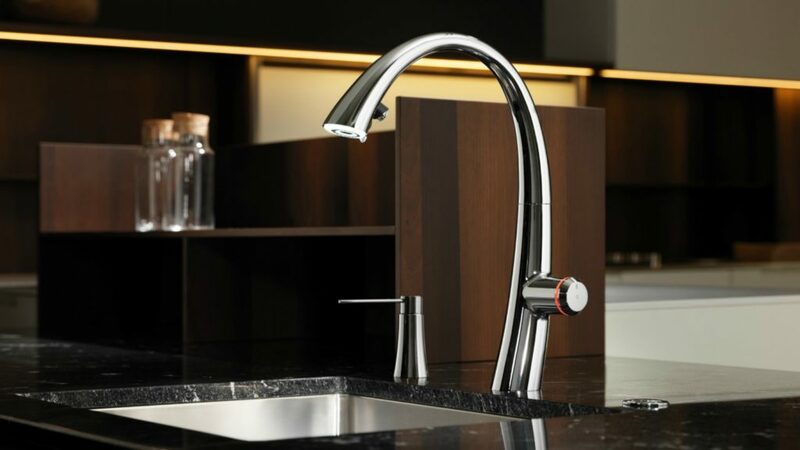 Zoe Touch Light Pro comes in a choice of chrome and steel and has been designed to complement KWC’s existing mixers and sinks. Parent company Franke announced the expansion of its KWC brand into taps at KBB Birmingham 2018.